Andrew Bourns and Gatsby – Photo By: Cealy Tetley. Bromont, Quebec – July 28, 2013 – The International Bromont ended this Sunday July 28th with Irishman Andrew Bourns’ stunning victory in the Quebec Original World Cup qualifying event, at the Bromont Olympic Equestrian Park. The course, designed by world renowned Leopoldo Palacios (VEN), comprised thirteen obstacles for sixteen efforts, with a time allowed of 85 seconds. Only three of the twenty-eight participating pairs made it to the jump-off, as there were many technical difficulties. The spa (a large obstacle) just before the triple combination proved to be almost insurmountable, forcing riders to play on the scope of the strides. Many had to forget about making it to the jump-off on that fence. The last double combination, with only one stride between both fences, did not leave many survivors. Derek Braun (USA) / Lacarolus, Liubov Kochetova (RUS) / Aslan and Andrew Bourns (IRL) / Gatsby were the only ones to qualify for the jump-off. American Derek Braun is the first in the ring for the second round, where, with Lacarolus, he executes a clear round in 42.77 seconds. Liubov Kochetova (RUS) on Aslan gets a better time than the first pair, but a fallen bar takes away their chance at first place. Andrew Bourns (IRL), last competitor in the ring, goes for broke on his mount Gatsby, a calculated risk since his quick and precise turns allow him to best Braun’s time by over two seconds, giving him first place. Quebec’s Angela Covert Lawrence, who finished in second place in last Sunday’s Grand Prix, climbed to a 6th place ahead of Andrew Bourns and his second horse, New Boy de Logerie. Montrealer David Arcand took 9th place with Vledder, just behind Mac Cone and Armor van de Rostal. International Bromont promises an unforgettable 2013 edition with five FEI events, the return of the Royal Canin Challenge (in collaboration with the Club d’agilité de la Montérégie), two Speed Derbies and a Hunter Derby. For more information on the programme, visit our site at www.internationalbromont.org. International Bromont, hunter and jumping competition, presents its 38th edition at the Bromont Olympic Equestrian Park from July 11 to 14, 17 to 21 and 24 to 28. International Bromont would like to thank the Ministère de l’Éducation du Loisir et du Sport as well as the Ministère du Tourisme du Québec for their support. General admission: $10 per person and free for children under 12. Preferred admission: $25 a ticket. Andrew Bourns & Gatsby. Photo: Isabelle Mark Beaulieu. Bromont, Quebec – July 18, 2013 – As the first FEI event concludes at the International Bromont, Andrew Bourns earns a well-deserved victory over Canada’s Olympian Jill Henselwood, by 2.05 seconds. The first round turned out to be challenging: only 6 teams make it to the jump-off, including Canadian Jill Henselwood on her two mounts, IV Ever and New Idol Z. On a course designed by Brazilian Guilherme Jorge, with 12 obstacles for 15 efforts including three double combinations, Jaclyn Duff (CAN) on Pater Noster is first to execute a clear round. Jill Henselwood, a member of the 2008 and 2012 Olympic teams, on her first horse IV Ever, a twelve-year-old Dutch warmblood, forces a jump-off with a clear round in 80.38 seconds. Ljubov Kochetova (RUS) and her horse Aslan join the two leaders for the second round, as do the duo of Mac Cone (CAN) and Amor Van de Rostal and Andrew Bourns (IRL) on Gatsby. Jill Henselwood also makes it to the jump-off on her second mount, a 9-year-old mare, New Idol Z. First in the ring, Jill Henselwood and IV Ever establish the time to beat with a clear round in 40.23 seconds. They will stay on top for the next four riders, as no pair, including Hensellwood and New Idol Z, beats their time. The entrance of the last pair, Ireland’s Andrew Bourns, changes the tone: they double the speed and take tight turns in order to best Canadian Olympic athlete Jill Henselwood. In the end, with a time of 38.18 seconds in the jump-off, Andrew Bourns steals the win. Thursday’s 1m50 is only the first of five FEI (Fédération Équestre Internationale) sanctioned events. The International riders will come back for another 1m50 class on Friday July 19, as well as for the 1m60 Grand Prix on Sunday July 21. The week of July 24 to 28 will give the riders an opportunity to participate in the third 1m50 class before closing the competition with the World Cup qualifier Quebec Original on Sunday July 28. 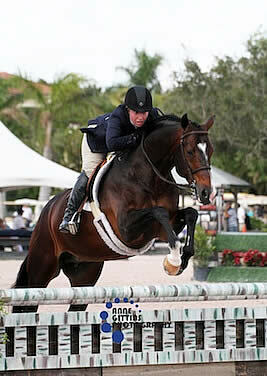 Wellington, FL – February 24, 2013 – The 2013 FTI Consulting Winter Equestrian Festival concluded its seventh week of competition, sponsored by Hermès, with action at two parts of the Palm Beach International Equestrian Center on Sunday. At The Stadium, Irish riders Andrew Bourns, Darragh Kenny, and Shane Sweetnam swept the top three in the $50,000 Hermès Jumper Derby with a win for Bourns and his mount Gatsby. In the International Arena, Praise and Sheila Motley won the Peggy Cone Memorial WCHR Adult Hunter Classic. Tina Allen and French Kiss were victorious in the $5,000 WCHR Amateur-Owner 3’3″ Hunter Classic. Richard Jeffery of Bournemouth, England, set a demanding track for Sunday’s jumper derby that featured 20 numbered obstacles, including the derby bank, table bank, open water, devil’s dyke and more. The number of challenging natural obstacles along with the length of the course and the heat of the day tested the stamina of all of the horses and riders competing. With only two clear rounds completed in the faults converted format, speed was key, and the top three riders finished with just three one-hundredths of a second separating them. Andrew Bourns and Gatsby went third in the order and cleared the course in 138.27 seconds to take the early lead. Two rounds later, Shane Sweetnam and Spy Coast Farm, LLC’s Little Emir had the time well in hand in 134.30 seconds, but a rail cost them four faults to eventually finish third in 138.30 seconds. Luis Larrazabal (VEN) and Gustavo Mirabal’s G&C Lepanto were even faster in 131.17 seconds, but had two rails down to finish fourth with a final time of 139.17 seconds. Darragh Kenny took the second place prize with Hays Investment Corporation’s Any Given Sunday. The pair had a total time of 138.29 seconds with time taken after a refusal at the devil’s dyke. Winning horse Gatsby is a nine-year-old Irish Sport Horse stallion by Simba x Cruise On. Andrew Bourns purchased Gatsby four months ago in Ireland and just recently brought him over to the U.S. This is the pair’s fourth week showing together and they have had consistent results. Bourns did not think that his time would hold up with the horses and riders that followed in the class, but he knew that he had a great round. Second place finisher Darragh Kenny was also very happy with his mount, Any Given Sunday. Despite a stop on course the pair still had one of the fastest times. Third place finisher Shane Sweetnam has had a lot of success with his experienced mount Little Emir, including the same placing in this class last year. Sweetnam noted that he had a fast time last year as well and ironically had the same jump down, but he was very happy with his horse. Bourns agreed that the class was a real crowd pleaser. “Any time a class goes down to the wire with such a tight margin, it makes it fun for everybody. It was thrilling,” he noted. World Championship Hunter Rider (WCHR) Week came to a close Sunday afternoon with the $5,000 Peggy Cone Memorial World Championship Hunter Rider (WCHR) Adult Hunter Classic. Praise and Sheila Motley bested a field of 56 over two rounds of competition during the fiercest week of competition for hunter divisions during the FTI Consulting Winter Equestrian Festival (FTI WEF). Praise, an eleven-year-old Royal Dutch Warmblood stallion owned by Dr. and Mrs. Kenneth Garber, and Motley were the pair to beat after a high score of 85 early on in round one and secured their victory with an 87 as the final trip in round two. With an overall score of 172, the pair edged out second place finishers Arriana Boardman and Gatsby by only a quarter of a point. Motley returned to the show ring during the 2013 FTI WEF after taking time off to have her son, Collins. Motley is happy to be back in competition, especially aboard a horse as spectacular as Praise. The pair has is currently first in the FTI WEF circuit standings for the La Mundial Adult Amateur Hunter 18-35 Section B division after taking home an extraordinary four championship titles. “I have a great horse in Praise. He’s done the derbies with Kelley [Farmer] and Holly [Orlando] for a couple of years, so there’s nothing like having one of those horses under you going into the Adults. I couldn’t be more thankful to Ken and Selma Garber for letting me show him down here all circuit,” Motley stated. Although Motley and Praise have been unstoppable in the ring every week at the FTI WEF, Sunday’s victory was especially significant. “WCHR week is the most prestigious week for hunters. Missing champion [Saturday] was a little bit of a let-down, so I couldn’t be happier,” Motley commented. Praise and Motley led the class after round one, but were last in the arena for round two as they chased Boardman and Gatsby’s first place standing. “Arriana is a great rider and [Gatsby] is a wonderful horse, so I knew that she was going to be good. I was maybe little more nervous than I would have been ordinarily. When you have other great riders like that with you, it makes you rise to the occasion,” Motley acknowledged. Not only is Motley managing to juggle motherhood with the demands of showing, she also runs her own event management company in Wellington. She credits the team at Lane Change Farm with enabling her to remain competitive at a high level. “It’s all about the people you ride with. You have to be able to show up and trust that the horse has been prepared and if you have the right team with you, there’s no need to worry. I hire the right people for my business, and Kelley and Larry [Glefke] do the same,” Motley described. While Motley’s professional life will continue in high gear, Praise will be enjoying a well-deserved slow down from showing while he continues being marketed to be bred. “Maybe he found some dates today. He’s on the market; he’s dating!” Motley joked. The $5,000 WCHR Amateur Owner 3’3″ Classic was the final class held in the International Ring on Sunday afternoon. Tina Allen and French Kiss won the class with an overall score of 168.5. French Kiss, a nine-year-old Westphalian gelding, was in third place after round one of competition with a score of 82 and came back late in the second round with an 86.5 with Allen in the irons. French Kiss and Allen have been showing at the FTI WEF for most of the 2013 circuit, picking up reserve championship honors in the FarmVet Amateur-Owner Hunter 3’3″ 36 and Over division just last week. “He’s been really consistent and I’m really happy with him,” Allen commented. Like the rest of her fellow competitors, Allen takes extra pleasure in winning during the hunters’ biggest week at the FTI WEF. “It’s special for sure to win this week. I’m really happy to have won today. Everyone loves competing during Hunter Week and it draws a big crowd,” Allen concluded. 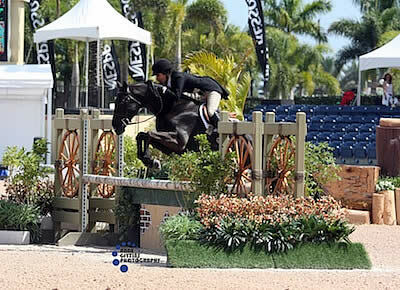 Florida Children’s and Pony Classics were the final rounds of WCHR competition during week seven. Francesca Dildabanian and Larkspur earned the top prize for the $2,500 Children’s Hunter 14 and Under Classic with a combined score of 176. Larkspur is a twelve-year-old Oldenberg gelding owned by Ashley Whitner. Gabriella Hurtadorode Dragonfly, an eight-year-old Oldenberg gelding, to a blue ribbon finish in the $2,500 Children’s Hunter 15-17 Classic with an overall score of 165. The winner of the Large Children’s Pony Hunter was Chatsworth and Emma Kurtz. Chatsworth, a nine-year-old Dutch Riding Pony gelding owned by Victoria Press, jumped to a final score of 168 with Kurtz in the irons. Sophia Marino and her own Posh, a thirteen-year-old Welsh Pony/Connemara cross mare, emerged victorious in the $2,500 Small/Medium Children’s Pony Classic with a combined score of 163. The $2,500 Large Pony Hunter Classic was topped by Daisy Farish and her own Beau Rivage, a seventeen-year-old Holsteiner/Welsh Pony cross gelding. The pair won the class with a total score of 174. Emma Kurtz collected another first place prize aboard Grand All Over in the $2,500 Medium Pony Hunter Classic. Kurtz rode Grand All Over, a fifteen-year-old Welsh Pony gelding owned by David Gochman, to a winning overall score of 176. Farish also championed the $2,500 Small Pony Hunter Classic aboard Further Lane Farm’s Rolling Stone with a final score of 170. Rolling Stone is a fifteen-year-old Welsh Pony gelding. Week eight of competition for the FTI WEF, sponsored by G&C Farm, runs February 27 – March 3, 2013 at the PBIEC in Wellington, FL. For full results, please visit www.showgroundslive.com.